Corn, (Zea mays), also called Indian corn or maize, cereal plant of the grass family (Poaceae) and its edible grain. The domesticated crop originated in the Americas and is one of the most widely distributed of the world’s food crops. 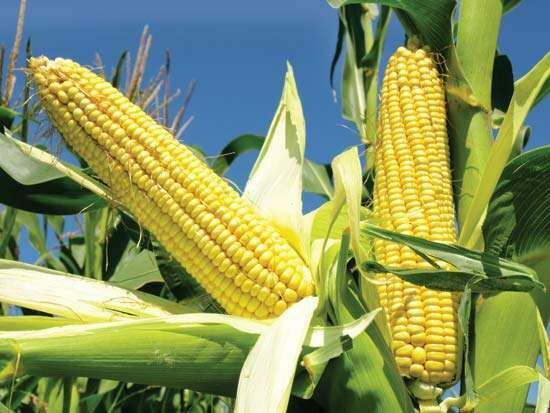 Corn is used as livestock feed, as human food, as biofuel, and as raw material in industry. In the United States the colourful variegated strains known as Indian corn are traditionally used in autumn harvest decorations. The corn plant is a tall annual grass with a stout, erect, solid stem. The large narrow leaves have wavy margins and are spaced alternately on opposite sides of the stem. Staminate (male) flowers are borne on the tassel terminating the main axis of the stem. The pistillate (female) inflorescences, which mature to become the edible ears, are spikes with a thickened axis, bearing paired spikelets in longitudinal rows; each row of paired spikelets normally produces two rows of grain. Varieties of yellow and white corn are the most popular as food, though there are varieties with red, blue, pink, and black kernels, often banded, spotted, or striped. Each ear is enclosed by modified leaves called shucks or husks. 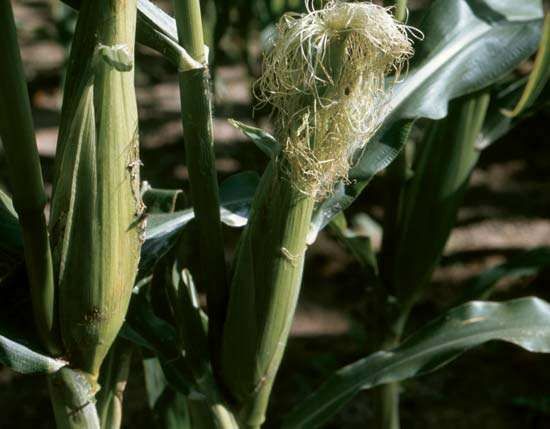 Many industrial varieties of corn are genetically modified for resistance to the herbicide glyphosate or to produce proteins from Bacillus thuringiensis (Bt) to kill specific insect pests. In addition, some strains have been genetically engineered for greater drought tolerance.